As many know, parenting isn't an easy job. It can be hugely frustrating and even lonely trying to figure out what's best for your kid. 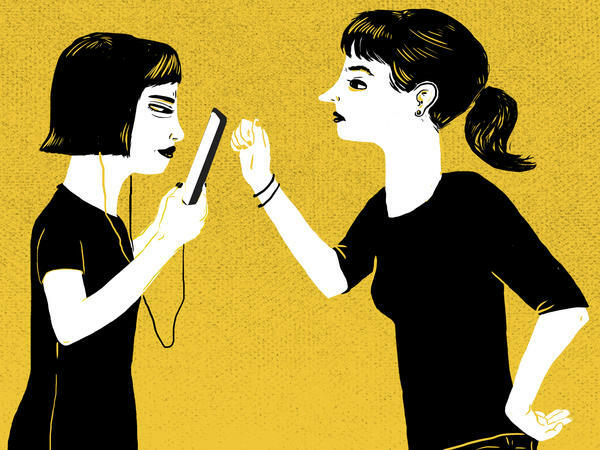 Should you be a taskmaster or a best friend? Is there a middle ground? The pressures of full-time work and round-the-clock activities can make that question even more challenging to tackle. Dr. Leonard Sax has experience in guiding these relationships as a family physician and psychologist in Pennsylvania. His new book, The Collapse Of Parenting: How We Hurt Our Kids When We Treat Them Like Grown Ups is informed Sax's personal and professional observations. "That's what motivated it, but this is not a rant. It's not a sermon," he says, adding that his book is grounded in more than 400 studies. In an interview with NPR's Rachel Martin, Dr. Sax discusses what he sees as a widespread trend of dissolving healthy relationships between kids and their parents. The point of the book is, look, you need to give kids choices in some domains but not in others. I'm seeing a lot of parents who are really confused about in what domain is it appropriate to give kids a choice. For example, is it OK for your 14-year-old to take their cell phone to bed with them? My answer is no. But so many parents think it is their job to be their child's best friend. That's not your job. Your job is to keep your child safe, make sure they get a good night's sleep and give them a grounding and confidence and help them to know who they are as human beings. So many kids today care so much more about the opinions of other kids than they do about their parents'. And that's really harmful because the regard of your peers, if you're an 8-year-old or 14-year-old, that can change overnight. So if you're concerned first and foremost about what your peers think, you're gonna be anxious. And we've seen a 400 percent explosion in anxiety among American kids in the United States over the last 30 years. An American kid in the United States is now 14 times more likely to be on medication for ADD compared to a kid in the United Kingdom. I can tell you exactly how it happens. Here's a typical story: This boy tells his parents that he's having trouble concentrating and focusing and they take him to a board-certified child psychiatrist. And the child psychiatrist says, "Ah, sounds like maybe ADHD, let's try Adderall or Vyvanse and see if it helps." And oh my gosh, what a difference — medication helps enormously. The child, the teacher, the parent and even the prescribing physician saying, "Hey this medication was prescribed for ADD, it's clearly been helpful, therefore this kid must have ADD." But he doesn't. The parents bring him to me for a second opinion and I ask some questions like, "What do you do in the evening?" and the parents have no idea, he's in his bedroom with the door closed so his parents don't know what's going on and they think he's asleep but he's not. He's staying up 'til 1 or 2 in the morning playing video games night after night. He's sleep-deprived. And if you're sleep-deprived you're not gonna be able to pay attention and all the standard questionnaires, Conners Scales, etc. cannot distinguish whether you're not paying attention because you're sleep-deprived or because you truly have ADD. It depends on how you've been parenting so far. And the earlier the child, the easier it is to make a change. If you've been the permissive parent who lets kids take their phones and their devices into their bedrooms with them, lets kids decide what's for supper, it's gonna be a challenge. And I recommend that you sit down with your child and say, "Hey, there's gonna be some changes here." So, for example, one mom took the cell phone away because her daughter's spending all her time texting and Snapchatting. And the daughter didn't push back. And her friends were like "Oh, you know her mom's the weird mom who took her phone away." The real push back — and this is what surprised this mom — came from the parents of her daughter's friends, who really got on her case and said, "How can you do this?" and this mom told me that she thinks the other parents are uncertain, unsure of what they should be doing and so that's why they're lashing out at her — the one mom who has the strength to take a stand. Parenting isn't an easy job. It can be hugely frustrating and even lonely. Trying to figure out what's best for your kid - should you be a taskmaster or a best friend? The pressures of full-time work and round-the-clock activities can make that question even more challenging to tackle. Our next guest is here with some guidance. Dr. Leonard Sax is a family physician and psychologist. His new book is called "The Collapse Of Parenting: How We Hurt Our Kids When We Treat Them Like Grown Ups." Welcome to the program, Dr. Sax. LEONARD SAX: Thanks for inviting me. MARTIN: Can you tell me more about that title, "How We Hurt Our Kids When We Treat Them Like Grown Ups"? What do you mean? SAX: Well, the point of the book is that, look, you need to give kids choices in some domains, but not in others. I'm seeing a lot of parents who are really confused about in what domain is it appropriate to give kids a choice. For example - is it OK for your 14-year-old to take their cell phone to bed with them? My answer is no, but so many parents think that it is their job to be their child's best friend. That's not your job. Your job is to keep your child safe, make sure they get a good night's sleep and give them a grounding in confidence and help them to know who they are as human beings. MARTIN: You do posit in the book that the most important thing for a child's development is a relationship with their parents and that in the absence of that, the peer relationship becomes paramount to them. Can you talk about what changes you have seen over the years and why that's a problem? SAX: So many kids today care so much more about the opinion of other kids than they do about their parents, and that's really harmful because the regard of your peers, if you are an 8-year-old or a 14-year-old, that can change overnight. So if you're concerned first and foremost about what your peers think and you're 8 years old or 14 years old, you're going to be anxious. And we've seen a 400 percent explosion in anxiety among American kids in the United States over the last 30 years. An American kid in the United States is now 14 times more likely to be on medication for ADD compared to a kid in the United Kingdom. MARTIN: And you think that's bad parenting, that the reason those kids have to be medicated or the reason that there are these high levels of anxiety, that this is somehow because parents have let their relationship with their child dissolve? SAX: I can tell you exactly how it happens. Here's a typical story. This boy tells his parents he's having trouble concentrating and focusing, and they take him to a board certified child psychiatrist, and the child psychiatrist says, oh, you know sounds like maybe ADHD. Let's try Adderall or Vyvanse and see if it helps. And oh, my gosh, what a difference. Medication helps enormously. The child, the teacher, the parent and even the prescribing physician think hey, this medication was prescribed for ADD. It's clearly been helpful, therefore this kid must have ADD. But he doesn't. The parents bring him to me for a second opinion, and I ask them questions like - what do you do in the evening? - and the parents have no idea. He's in his bedroom with the door closed. Parents don't know what's going on. They think he's asleep, but he's not. He's staying up until 1 or 2 in the morning playing video games night after night. He's sleep-deprived. And if you're sleep-deprived, you're not going to be able to pay attention. And all the standard questionnaires, counter scales, etc., cannot distinguish whether you're not paying attention because you're sleep-deprived or because you truly have ADD. MARTIN: All this stuff is hard to measure, and you yourself note that your book is based on your personal experiences and observations as a professional. MARTIN: But you are confident. You are confident that what you're saying is true and right and that there is one way. SAX: Well, I don't agree with that. The confidence is based in the research that I cite, the longitudinal cohort studies with thousands of kids conducted in many different demographic settings over many years. MARTIN: You make no bones about the fact that this is hard, though. I mean, what you're talking about is telling your kid no. And that creates, perhaps, drama and negativity. And a lot of parents, especially people who are holding down jobs - one or two - that's hard to do when you're exhausted at the end of a day. SAX: Well, it depends on how you've been parenting so far. And the earlier the child, the easier it is to make a change. If you've been the permissive parent who lets kids take their phones and their devices into their bedroom with them, lets kids decide what's for supper, it's going to be a challenge. And I recommend that you sit down with your child and say hey, there's going to be some changes here. So for example, one mom took the cell phone away because her daughter's spending all her time texting and Snapchatting, and the daughter didn't push back. And her friends were, like, oh, well you know, her mom's the weird mom who took her phone away. The real pushback - and this is what surprises mom - the real pushback came from the parents of her daughter's friends who really got on her case and said - how can you do this? And this mom told me that she thinks the other parents are uncertain, unsure of what they should be doing and so that's why they're lashing out at her, the one mom who has the strength to take a stand. MARTIN: Dr. Leonard Sax is a family physician and psychologist in Pennsylvania. He's written several books on child development. His most recent book is called "The Collapse Of Parenting: How We Hurt Our Kids When We Treat Them Like Grown Ups." Dr. Sax, thanks so much for talking with us. SAX: Thanks for inviting me. Transcript provided by NPR, Copyright NPR.